President and CEO of EZSolution, Tom Malesic, has a passion for helping business owners grow their businesses. His two books, What Your Web Developer Never Tells You and What Your Computer Guy Never Tells You were written for entrepreneurs who want to avoid the pitfalls associated with developing a new site, or want to turn technology into a competitive advantage. "Some people say there's one good book in all of us. I say, if you can write one book - why not keep writing? "As a business owner, I'm always looking for ways to make better decisions. Both my books focus on helping business owners make educated choices when it comes to web development, internet marketing, and computer support. "If you're a business owner and want to avoid the mistakes of hiring the wrong computer guy or web developer, then these books are perfect for you. I invite you to read both, and hope that they’ll offer valuable ways to grow your own business." How Do You Get a Copy? If you're current client, call the office at (717) 291-4689 and we'll send you a free copy. If you're not a client - but want to see if we can help with your website - schedule an appointment. We'll give you a free copy after we meet. If neither of the above applies, simply call the office at (717) 291-4689 to pay by credit card. 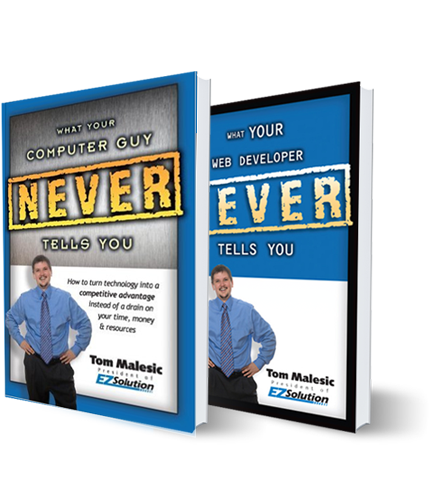 Each book purchased directly from EZSolution costs $19.99 (a $10 discount from the list price). Visit Amazon (Web) (Tech), and you can purchase either for $29.99.